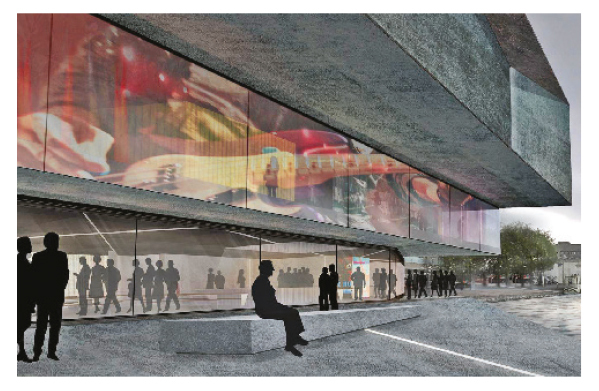 In late August, U2’s desire to build a dedicated 2,864 sq metre visitor centre / exhibition space to themselves on Nos. 15-18 Hanover Quay received a polite but firm push back from Dublin City Council. The proposed new attraction would replace their existing two-storey recording studio with a dark, brooding four storey block by Dublin practice, ODAA. In a detailed report, the Planner acknowledged local and business concerns about the character and bulk of the proposed 14.4m high building, and requested substantial changes that may now put the scheme’s viability in doubt. In its decision, the Planning Authority stated that it, “has serious concerns regarding the height of the proposed building”, particularly its impact on Six Hanover Quay (6HQ), a 120-apartment development, recently acquired by Carysfort Capital for a reported €101m. Consultants for Carysfort, had strongly objected to the “monolithic” centre. The Board of (residential) management company CLG also lodged an objection on behalf of its 63 residents at 5-7 Hanover Quay, arguing that the new centre, “will create significant amenity issues… including overshadowing of apartments.” In total, the application met with ten objections. The Planner asked the applicant, “to reconsider the second floor façade fenestration treatment” and, “to reassess and explore options regarding a reduction in height to the proposed development.” No target height was set, but the narrowness of the site already makes accommodating the various themed exhibit areas, a café, auditorium, reconstructed original studio, and merchandise store, a challenging task. The applicant was requested to provide further details on projected visitor numbers. Should those numbers prove too high, the venture’s anticipated success might turn out to be its downfall. The Council would be mindful of the surrounding narrow streets heaving with an influx of fans and rock pilgrims. Yet it is the very potential of a local tourist bonanza that has drawn submissions in support from the Dublin Chamber of Commerce, Fáilte Ireland, and the Irish Hotels Federation (IHF). An apparent lack of coordination between the two seems all the more curious when one considers the long-time association of Crosbie and U2. Together they restored the Clarence Hotel in Temple Bar, and U2 gave the first concert at Crosbie’s Point theatre in 1988. Crosbie had, in fact, previously owned the U2 building. The Dublin Docklands Development Authority (DDDA) compulsorily purchased it from the band in 2002, and U2 eventually bought it back from the DDDA in 2014 for around €450,000. The following year, the Irish Independent reported Crosbie to have been upset that this sale took place without his knowledge.